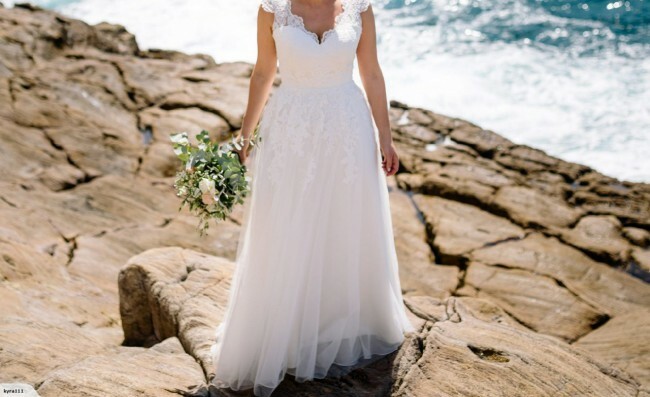 Worn once for my wedding in December 2017, I have decided to sell my dress to allow someone else to wear this gorgeous dress! The dress is in fantastic condition, and was drycleaned after wearing at Regal Drycleaners (which cost me $400). It has been stored in a dark room, hanging up, for the last year. Will update this listing with measurements. Slight alterations to the dress to suit my slight hourglass shape, taken in at the waist. Once you send a message, Kyra can invite you to purchase the dress.